Steve Brookes was followed by David Woolcock, curator of Paradise Park and trustee of the World Parrot Trust. David reiterated the comments of previous speakers in saying that a very high percentage of the world’s parrot species are endangered, so this is a massive global problem, but that we can all play a part to help out. The major problems are global warming, trapping, deforestation, and a rising human population. There are large, expensive, high-profile projects like that set up for the re-establishment of Spix’s Macaw in the wild, but there are many smaller, local efforts worldwide. Comparatively familiar species to parrot-lovers, like the African Grey Parrot, Sun Conure, Umbrella Cockatoo are all threatened in their native habitats. David emphasised the importance of aviculturists in this regard, saying that species such as Red-vented and Citron-crested Cockatoos, Golden-shouldered Parakeets, and Mitchell’s Lories are critically endangered in the wild, but are comparatively numerous and bred successfully in captivity. Our speaker went on to say that not all people that are interested in parrots keep or breed them, but that we can still help by providing our talents or specific skills to conservation, as well as time. There are many volunteering opportunities worldwide, and David mentioned Tasikoki and Bonaire, as well as many British Zoos. Such projects feature plant care and estate management, as well as direct bird care. He emphasised that campaigning and petitioning is also important for all of us. The trade in wild-caught birds has been a leading cause of their decline, and such petitioning had a significant effect on the banning of such trade – at least to Europe and America. However, still many parrots are exported to the Middle and Far East. The latest efforts have led to the upgrading of African Grey Parrots to CITES Appendix 1. David said that 1.3 million of these birds had been exported from their native territories in the last 40 years, depleting the natural population by 99%! He went on to encourage education projects in schools and parrot environments, and the dissemination of responsible aviculture. He suggested joining and supporting conservation groups, and making financial donations, however small. David left us all in no doubt, before we broke for tea, that every single one of us can help out in some way in the worldwide problem of parrot conservation. 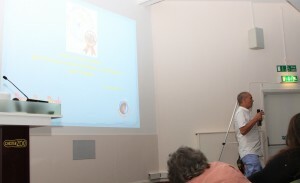 Our next presentation of the day was somewhat different from the rest in that it did not focus on worldwide conservation projects of particular species, but rather covered the latest research on a virus infection that has devastated some parrot collections, and thereby has relevance to their long-term survival. Not only that, but the Parrot Society’s Conservation Fund has part funded this research. 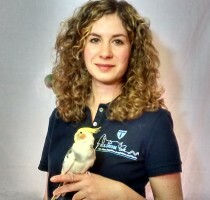 The speaker was Julia Heckmann, one of a team of veterinarians working under Professor Dr Michael Lierz, at the clinic for birds, reptiles, amphibians and fish of the Justus-Liebig University in Giessen, Germany. Michael is a long-standing avian veterinary colleague of mine, meeting at Association of Avian Veterinarian (AAV) seminars, and he had approached me as PSUK Chairman for assistance in funding this important work. The European Committee of AAV (EAAV) also awarded a research grant to this project. The disease involved is most commonly known to parrot enthusiasts as Macaw Wasting Disease, the name given when it was first identified in these large parrots in the 1970s. However, it soon became recognised in some 60 other species, and as its distinctive feature is an enlargement of the fore-stomach, or proventriculus, then the name was changed to Proventricular Dilatation Disease (PDD) or Proventricular Dilatation Syndrome (PDS). In those early days its causal agent was unknown, although a virus was suspected, but recent (2008) work in the USA and Germany has now confirmed the Avian Bornavirus to be involved, and the name has been changed yet again to Avian Bornavirus Disease (ABD). Julia started by telling us the major problems with this devastating infection: that it does not produce clinical signs in all birds, and the incubation period is very long – several months, or even years. Thus many infected birds can be undetected carriers of this virus, and a ticking time-bomb in a valuable collection. Add to this the fact that current diagnostic tests are not always reliable, with false positive and false negative results, and one can understand the problem this virus poses to parrot keepers and avian veterinarians. Bornaviruses have been recognised in sheep and horses already, and the variety affecting birds was named Avian Bornavirus. They have been found in canaries, geese, swans, finches and monal pheasants, but with no clinical signs in these species. Eight different genotypes have been identified in parrot species. Its probable origin was Bolivia, but it is now judged to be prevalent worldwide. One European study sampled over 1400 parrots from 215 different collections, using swabs from throat and vent, as well as blood samples, and nearly 23% showed positive for Parrot Bornavirus, although very few showed clinical signs. Typical signs in clinically affected birds are weight loss, the passing of undigested seeds in the droppings, and vomiting. Radiography (X-ray examination) in these cases will show an enlarged proventriculus, and post-mortem examination (PME) confirms the enlargement, with extreme thinning of the stomach wall. Similar clinical signs may be seen if foreign bodies, intestinal parasites, or yeast infections are involved, but at PME the stomach wall in these examples is usually thickened. Heavy metal poisoning (zinc and lead) can also result in vomiting and weight loss, but usually with blood in the droppings. 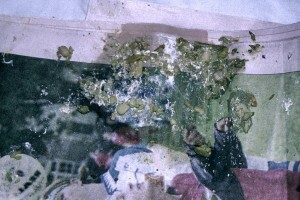 Undigested seeds in a parrot's droppings. 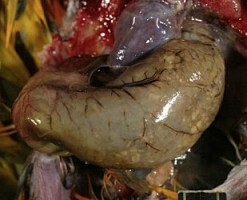 This is not exclusive to ABD, but is an indication of digestive disease. 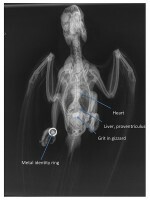 Radiograph of a normal parrot showing the 'hour-glass' shape of the heart/liver/proventriculus cluster. In ABD this shadow would be massively distended, with the proventriculus filling the grey air-sac space to the right of the liver. Lateral radiograph showing a distended proventriculus (arrowed) so thin-walled that seed material can be seen within. Barium has been given as a contrast medium, and shows as white in the crop (left) and the intestines (right). Close up of a very distended proventriculus, demonstrating how thin it becomes, with seeds visible through it. However, the intensity of clinical signs is very variable, and can be very gradual in onset. Many birds will also show neurological signs, including balance issues and blindness. Julia showed a video of a cockatoo having difficulty in holding on to its perch, and picking up food items awkwardly. Feather plucking can also be a side effect in infected parrots. The virus produces these variable signs by invading nerve bundles and ganglia, and depending on which nerves are inflamed, so the clinical signs will vary. 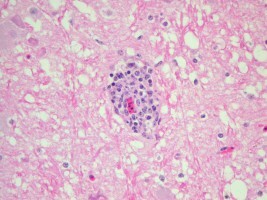 Definitive diagnosis rests on identifying this ganglioneuritis histologically, with masses of inflammatory cells around the infected nerve fibres. Easy at PME on the dead bird, but more difficult in the live patient! A biopsy from the crop has been recommended as a diagnostic test, and is relatively easy to perform, but in this University’s studies, only 76% of positively infected birds showed lesions in the crop. Biopsies from proventriculus and gizzard showed 86% and 93% positive ganglioneuritis respectively, but these samples are far more invasive and difficult to perform in the live bird. Swabs taken from the crop and cloaca (vent), and blood samples are far easier to obtain. These are then tested in a laboratory for virus RNA, or anti-viral antibodies. However, not all samples will show the presence of the virus. In 276 known positive birds tested, virus material was detected in just 35 of the swabs, 45 of the blood samples, and only 25 in both. So many ‘negative’ test results would be unreliable. Having discovered Bornavirus, further work was needed to prove that this apparently ubiquitous virus was indeed the cause of clinical PDD. Julia described experiments in which Avian Bornavirus obtained from macaws (ABV4) and cockatiels (ABV2) were injected into virus-free laboratory cockatiels. 100% of the infected birds developed ABV antibodies in their blood, and viral RNA was recovered from crop and cloacal swabs, but not all developed clinical signs, even by this injection of active virus. In those that did become ill, ABV4 produced milder, mostly neurological signs, while ABV2 resulted in more severe, gastro-intestinal signs. Follow-up tests attempted to demonstrate the natural route of infection between birds. Trials included dosing live virus via the nose, mouth and open wounds, but none produced clinical disease in any of the tested birds. This may be because virus taken from macaws was given to cockatiels, or that the dose of virus was too low, but either way to date there is no confirmation of the natural route of this infection between birds. So what does all this mean for the parrot enthusiast? Julia summarised these findings as follows. Avian (Parrot) Bornavirus causes PDD and neurological signs. Confirm PDD diagnosis by ruling out other conditions such as yeast infections etc. Test for ABV with crop and cloacal swabs and blood samples. Separate positive birds from negative birds into different units. Problems arise in that PDD affected birds shed lots of active virus, while ABV+ carriers shed small amounts of virus only intermittently. Some may become temporarily infected, but eventually eliminate the virus and make a full recovery. A third separate quarantine unit is therefore required. Negative birds that remain negative on comprehensive repeat testing may be considered virus free, and can form the foundation of a new (breeding) collection. Negative birds that subsequently test positive should be moved to the quarantine unit until future tests determine whether or not the individuals are permanently infected (in which case they should move to the positive unit), or just transiently infected with subsequent elimination of the virus, in which case they can return to the negative unit. However, this situation needs to be handled carefully, in the light of what has been said above about the variable test results. Birds in the positive unit that persistently test positive should remain where they are, while those that subsequently test negative can go to the quarantine unit until further follow-up tests have been carried out. If they then remain negative, they may be considered as virus-free, and move to the negative group, while if they re-test as positive again they should return to and remain in the positive unit. Any new birds acquired should go into the quarantine unit in the first instance. A complex and time-consuming system, but at present the only sure way of controlling this problem! Certainly what should not be done is to dispose of known ABV-positive birds to other parrot-keepers, without disclosing the problem. It is in this way that this infection (as well as others like PBFD) have been irresponsibly spread so rapidly in the past, and with devastating effects on people’s collections. Julia made the point that persistent ABV-positive, but clinically healthy birds (i.e. no signs of PDD) should not be put to sleep, but should be kept in isolation. They may even be bred from, if the youngsters are taken away for hand rearing (Although I would qualify with that with caution, until we know for certain that the virus cannot be transmitted through the egg). This complex but fascinating presentation concluded with some thoughts on potential treatment for PDD. Julia told us that to date all anti-viral drugs have failed to improve or cure the condition (and are in any case very expensive). The non-steroidal anti-inflammatory drug Meloxicam has been recommended for affected birds, in an attempt to reduce the gastro-intestinal inflammation, but its actual benefit has not been proven statistically. In the future, a vaccine to prevent development of the disease may become available, but that is a long way off yet. Although invasion by Avian Bornavirus produces detectable antibodies in the blood, these antibodies appear to have no protective effect against the disease, so production of an effective vaccine will be difficult. Currently, all that can be done for parrots with clinical signs of PDD is to feed them on easily digestible food (ideally pellets); to avoid stressful conditions as far as is possible; and to treat potential secondary infections. Such birds should be kept isolated from unaffected individuals, with good hygiene practiced, but ultimately death or euthanasia will be the result for these unfortunate parrots.